Heya! If everything goes as planned I'm still enjoying my summer holidays. So I scheduled this post and hopefully Mr. Blogger will behave and post it as its supposed to. Today a great new event started at Crafty ribbons Pure inspiration blog. Since our Best of British event was such a success (thanks everybody who joined in! ), we decided to do another event, again with LOTS of gorgeous projects from my teammies and also with lots of fantastic prizes from our sponsors. Olympics are just around the corner so we decided to bring some "olympic spirit" to the Blogland as well, that's why our event is called "Crafting for gold". :D Each day there will be a new chance for you to win some goodies from that day's sponsor. You can join in every day and try your luck, but please be fair and only enter once each day. This card was made for a very nice lady. I was lucky enough to win a candy on her blog so I sent her this thank you card. I have to admit I was very happy with how this card turned out, I think it's one of my favourites. It looks better on my bf's computer (I wonder what I did with my computer screen, I think I might have changed some settings by mistake :S) than it does on mine. I just hope it looks ok on your computer too. Both design papers are from my stash and I have no idea from which company they are. I wish I did know though, because I like them a lot and I want more. *sigh* The doily and crystals are from my stash. 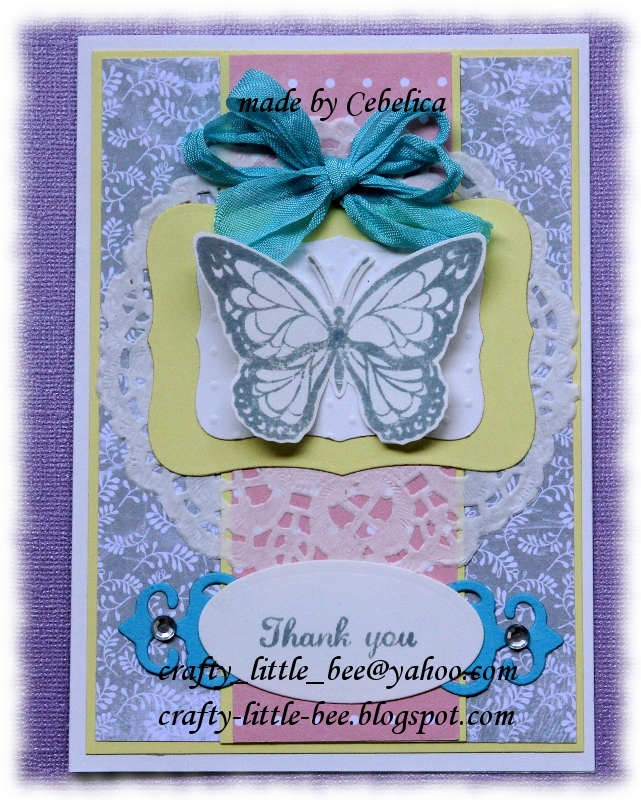 The butterfly stamp is from Inkadinka clings and the sentiment is Fiskars' stamp. The ribbon is from Crafty ribbons - I used their gorgeous seam binding ribbon - bolo blue. I hope you'll have a look around and join us at our event. I wish you a great day! 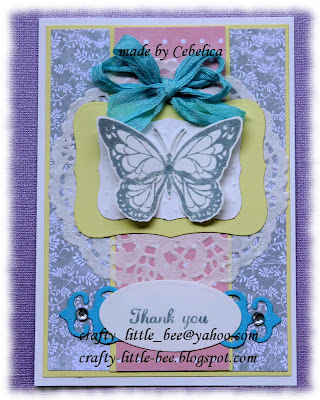 Hi Cebelica this is simply gorgeous the colours are so pretty I adore the butterfly and that bow a super card.